How about a video intro? A short animation on our take regarding online subscriptions. Interested in learning how they compare to other forms of monetizing, like donations and banners ads? Our short promo showcasing the simple concept behind Onscribe. 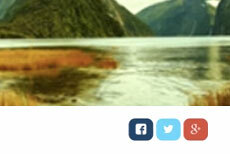 In this tutorial video, Andrew uses the embed code on his site in a few easy steps. Keep track of all the content that you subscribe to. 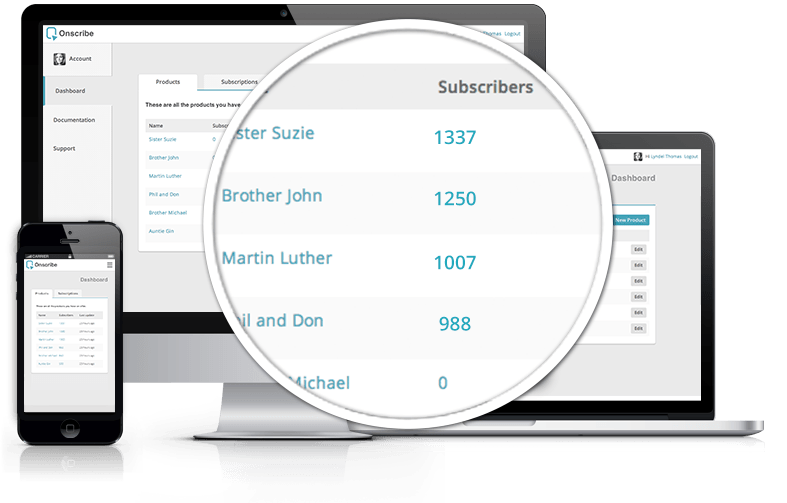 Manage your subscriptions in one easy interface. Onscribe makes it easy for users to subscribe to your content, so you can get the reward you deserve. Access your subscriber data using a simple REST api and SDKs for popular coding languages. Avoid the pesky ads and constant reminders for support, while rewarding the people that create the content you love; use any of the popular methods supported, like Paypal or Facebook Payments. Do I need an Onscribe account to subscribe to content? Onscribe uses existing payment services that you probably already use, like Paypal and Facebook Payments. So you don't need an Onscribe account to subscribe to content. Of course if you want and Onscribe account, it's free for users and we have lots of cool tools to help you keep track on content you subscribe to. Do I have to enter my financial details in Onscribe? No. Because we use existing, trusted services like Paypal and Facebook Payments, you don't have to worry about providing your financial details to Onscribe. Allow your users the freedom to pick their own payment gateway, while Onscribe automates the process of grouping, tracking and reporting on your subscribers. Yes! It takes just minutes to setup. Onscribe generates a few lines of code that you paste into your product page and this generates the payment buttons that your happy fans will click to subscribe to your content safely and easily. And if you use Wordpress, we've got you covered with a plugin that makes it even easier. You get paid directly by each payment provider you have chosen for a specific product. We don't hold onto your money, and we don't charge a fee or commission. 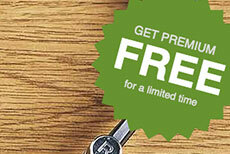 It's free for up to 5 products and 1000 subscriptions. Premium plans are only $3 per month. We don't cut down on features but simply offer more bandwidth. Does Onscribe take a cut of my subscriptions? No. We don't take any commissions from your transactions. Of course you'll be charged the regular fees from the provider you choose, but that's between you and them. Get creative with your data and achieve even more with some programming. Free for personal use, for life. Our focus is to create a specialized service around online subscriptions, that can be used broadly in different ways. We're welcoming everyone that would like to use Onscribe and it is our aim to never apply any fees on the subscriber side; it's the least we can do for honoring us with your participation. For the individual or small team with moderate traffic and products. Free for life, or upgrade anytime. Easy to use web interface, for desktop and mobile. For professionals with high traffic demands. Generous allowance for products and subscriptions. Complete control of a server with Onscribe pre-installed, ready to run from your custom domain. Available as an EC2 server at the AWS marketplace.